Cantherellus cibarius, the golden chanterelle, grows on forest floors, often near conifers, deciduous trees, but also in fields, beginning in July and ending as late as January. The genus Cantharellus, named for the Greek kantharos, meaning cup, is a mushroom found growing wild throughout the world. Efforts to cultivate these mycorrhizal fungi have failed, because it is impossible to recreate the complex symbiotic relationship they have with host plants. 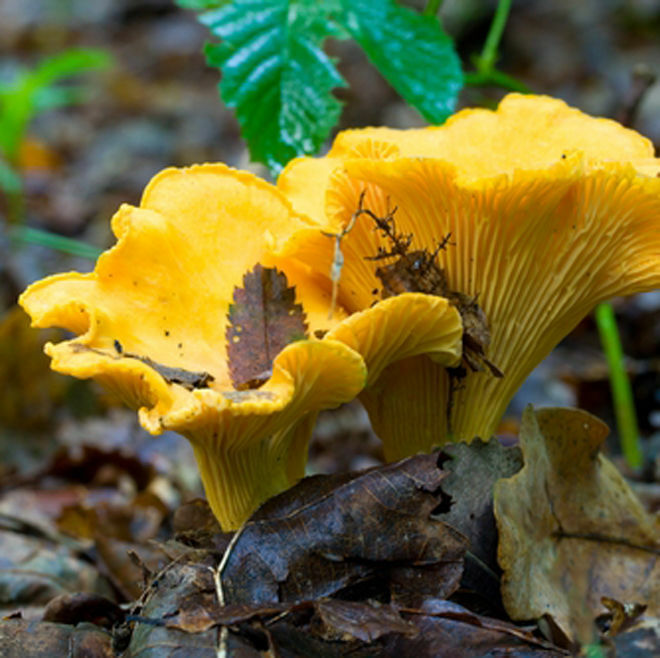 While the shape can vary, from the young chanterelle with a small, rounded cap to the mature mushroom with a flower-like, unfurled cap, the color is distinctive. The beautiful golden-orange cap with a goblet shape is easily spotted on the forest floor; though there are some toxic lookalikes. The jack-o-lantern mushroom is also orange in color, but is found growing in clumps, which chanterelles never do, having a gregarious growth habit (that is, singly, but clustered near each other). The chanterelle has firm, meaty flesh and an ethereal fruity, apricot aroma and flavor, though these grow fainter as the mushroom ages. The texture also varies with size and age. When young, buttons are firm, but the larger they grow, the more fragile the flesh becomes. Brown or frayed edges of the cap indicate drying and that the flavor is dissipated. Chanterelle stems are solid, not hollow, and the surface of the mushroom is smooth. Flesh ranges in color from white to pale yellow. The underside of the cap has false gills–rounded gill-like ridges that branch irregularly and run down the stem—which is one of its identifying features. Chanterelles contain beta carotene and vitamin D & B as well as the minerals potassium, copper and selenium. Wild mushrooms can present a challenge to clean. The chanterelle cap folds tightly and has crevices that collect debris, from pine needles to bugs and dirt. The caps will grow around twigs, so it might be necessary to cut out sections of mushroom that have embedded sticks. Cut off the foot of the mushroom stem where dirt tends to clump. Use ice cold water to rinse chanterelles, but wash quickly and dry thoroughly. Or use a dry toothbrush or a mushroom brush to remove surface dirt and sand. Brush the false gills under running water, or cut them out entirely if they are filled with dirt. Drain on paper towels to remove any moisture. The time taken in the cleaning process is rewarded when you don’t have to spit out debris later. For such an ethereal looking mushroom, the flavor of the chanterelle is powerful. The golden chanterelle has apricot nuances and a slightly peppery punch that pair well with cream and butter. And it’s hard to mask the flavor, even with cheese, which makes them an ideal wild edible for all kinds of cooking. Chanterelles complement pork, chicken, rabbit, veal and quail, either in a stuffing or with a sauce. 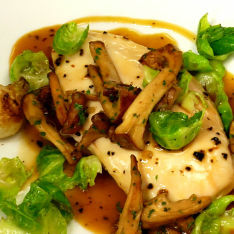 A simple sauté with olive oil and shallots will allow you to experience the full flavor of this extraordinary mushroom. Use chanterelles anywhere you would use a mushroom: on a burger, in risotto, quiche, in a white wine sauce, or simply sautéed with butter and fresh herbs. Many believe this mushroom needs little more than a generous amount of butter and some salt and pepper. Chanterelles and pasta make a natural pair, as do eggs and chanterelles. 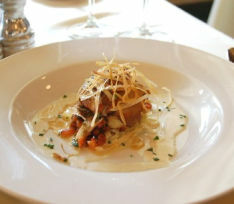 Chanterelle mushrooms will add depth to stews and can be miraculous with scallops or shellfish. Chanterelles are suitable for drying and maintain their aroma and flavor well, though the texture is entirely altered, tending to be chewy. Dried chanterelles can be pulverized into flour and used as a seasoning in soups and sauces, especially creamy ones. NOTE: Do not eat mushrooms you have found in the wild unless they are identified by a mushroom expert as100% safe.